In February we had the chance to meet a father and son that decided to take a 13 days trip around Argentina. 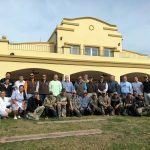 It was fun to help them organize a great fishing and hunting adventure that included Fishing in Patagonia, visiting Buenos Aires and a 4 day visit at our Estancia Cortaderas to enjoy dove hunting and Dorado fishing. Andy and Jake, father and son, arrived to Buenos Aires in February and where met by our “meet and assist” person, Sandra, at the international airport of Ezeiza [EZE]. She was in charge of the transfers and organizing a City Tour of Buenos Aires, so they got a glimpse of this big city. As always, Sandra did a great job and took care of all the transfers and assisted these gentlemen through all their stay in Buenos Aires. After staying one night in Buenos Aires, father and son departed to San Martin de Los Andes, where they enjoyed 5 days of fly fishing in the best rivers in the area. I am happy to say that Argentina’s Best Hunting organized also this part of the trip, giving them the chance to relax and have everything done through our sales department. After an amazing time in Patagonia, they flew back to Buenos Aires, where they relaxed for a couple of nights, enjoyed the city and got ready for the best combo of dove hunting and fishing in Argentina. Sandra picked them up early at the hotel and after a 10 minute transfer; Andy and Jake were ready to take the 1 hour flight that took them to El Sauce Viejo airport [SFN] in Santa Fe. 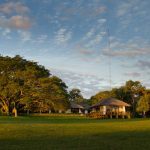 After landing here, Estancia Cortaderas staff met them and drove them to the lodge. The itinerary had 2 days limitless dove hunting and 2 days Dorado fishing. 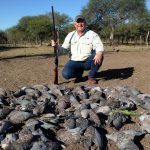 The first afternoon, as we usually do, they started with a dove hunt, and as it always is… the doves were flying everywhere and the hunt was out of this world. To put it in numbers, the first afternoon they shot 21 boxes each and this was only a warm up! To be honest, this is the only way good business prospers, the fishing the first day wasn’t like the dove hunting. It had rained very hard in the upper part of the river, the water was muddy and this gave us a hard time to find a good spot for the Dorado fishing. 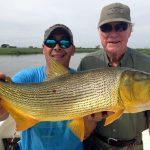 But, as you may know, a big part of being able to give our guests a good experience is to have a great scout, so the next day Omar had found the best place in the river and Andy and son were able to enjoy Dorado Fishing at its best! After being 4 nights in Buenos Aires, 5 nights in Patagonia and 4 nights at Estancia Cortaderas, the dove hunting and fishing adventure came to an end; and as the day they arrived, Sandra drove them back to the international airport. People say that good things don’t last long, trust me, good memories last forever. 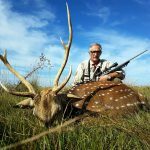 This is what Argentina’s Best Hunting is all about, blending excellent service, the best accommodations, amazing dove hunting and Dorado fishing, so you take back home a wonderful experience and good memories to share with friends and family.